(It doesn't have to be $7. We only use $7 for our example of what could be done here. This is Free Will Giving only. This section of the OIC is NOT about "INCOME" at all. This section is about "FREE WILL GIVING" ONLY. ...and it's about living a BLESSED LIFE, including in your FINANCES! It's about Becoming Generous GIVERS and living "Beyond Blessed". Everything we have, comes from the Lord. Here's a great video series that teaches all about "GIVING". GOD, MAKE US RADICAL GIVERS AND A RADICAL HARVESTERS! AMEN. Galatians 6:10 - 10 So then, as occasion and opportunity open up to us, let us do good [[i]morally] to all people [not only [j]being useful or profitable to them, but also doing what is for their spiritual good and advantage]. Be mindful to be a blessing, especially to those of the household of faith [those who belong to God’s family with you, the believers]. As the Lord blesses us financially, I pray that the Holy Spirit will also give us the desire to become GENEROUS GIVERS as we are lead by Him. IF we are led to give $ to someone in the OIC... we are completely free to do that. I have already done so, many times. I just get their Paypal email address and send $ to them through Paypal using "Send to a friend". BUT, what I or any one of us can do alone, is limited to a little bit. Just a few dollars here and a few dollars there. (It doesn't do a lot of help. But it is helpful a bit). It's not an ongoing monthly....BLESSING. And it's just a trickle. Not a impactful amount. So....how can we do this in the OIC? We cannot give out everyone's personal email addresses, for their Paypal accounts. BUT WE CAN GIVE OUR MEMBERS A LIST OF UP TO 7 OF YOUR UPLINE OIC COACHES! So...that's what we'll do! Now with the $7GT, OIC COACHES can give their team members a list of the Paypal email addresses of up to 7 of their closest OIC Upline Coaches! So that IF you ever want to give to any of them, you can! NOW, how can we give out just 7 PayPal email addresses to our members and also EXPAND the amount each person COULD RECEIVE by expanding the amount of people who want your email address so they can give to you? hummm? we could each give just $7/mo! "YES! I want to participate in the 7DGT! Please send me a List of up to 7 of my OIC Upline Paypal email addresses!" Each list builds up to where it has 7 email addresses on it. When a list has 7 people on it, the next person would remove the person from the top, move everyone up, and add them-self to the bottom of the list. Keeping just 7 people on each list. People roll off the top of the list and new people are added to the bottom of the list. AND now we are putting the power of leveraging and multiplication to work! Let's say that you want to participate in our $7GT. So you decide to ask your OIC Coach for their $7GT list of email addresses. Your coach sends you their list, and then...you add your email to the bottom of the list. Now, as you build your OIC Network, let's say 4 people that you are training, ask you for your $7GT list because they want to join the $7GT with you. So JUST mathematically speaking, in 7 generations of multiplying by 4, a person could be on 21,844 LISTS! SOME of those 21,844 may truly send $1 Monthly to everyone on their list! THAT'S A LOT OF LISTS THAT A PERSONS EMAIL ADDRESS COULD BE ON! NOBODY WILL SEND YOU ANY $ AT ALL! EVEN IF YOU ARE ON A BILLION LISTS. That's between them and the Lord. THIS IS COMPLETELY FREE WILL GIVING. as often as we want. and we WANT to... then we do it! If we don't want to....then we don't! It doesn't matter, because GOD IS OUR SOURCE. And He can bless us through any means He chooses. EVERY OIC MEMBER CAN GET ON THE $7GT LIST. HE TELLS YOU TO DO. NOTHING ELSE. DO NOT "GIVE" TO "GET" ANYTHING. WITH GOD! ...ALL THINGS ARE POSSIBLE!!! We'll make a list with our PayPal email addresses on it. Each list - HAS ONLY 7 PayPal Email Addresses - on it. The e-address at the TOP rolls OFF as the next OICer adds theirs to the bottom of their list. Whenever someone that you are coaching, tells you they want to join the 7DGT, you will send them your 7DGT list. Everyone can GIVE, AS THEY WANT, to any of the e-addresses on the list sent to them from their OIC coach. Then, they can make a new list by adding their PayPal Email Address to the bottom. This new list is the one that they will give to the people that want to join the 7DGT with them. So JUST AS AN EXAMPLE, let's say that you had 4 OICers join a $7DGT list with you. And they each have 4 OICers join with them, and THEN THEY have 4 OICers join with them...and on, and on, and on, and on....now this is just an example, it will never happen exactly like that...but YOUR PayPal Email Address could be on a LOT of OIC Giving Tree lists. Using the example above and having 4 people ask to join the 7DGT with you, you would be on 4 lists. Then when 4 people join with those 4 people, you would be on 16 more lists. As our example of 4 keeps happening, you could then be on 63 more lists, then on 256 more lists, etc, etc, etc! It would be wonderful if everyone would get the vision and GOAL of giving $1 every MONTH, to EVERYONE on the list they got from their coach! That' it! They will send their 7DGT list to you. but they won't have7 e-addresses on their list. It's all up to you. Do whatever God puts on your heart. Maybe you only want to give $1 to just one OICer on your list. Right now, the Lord is leading me to just start with a $7 a month seed and then I'll keep following Him as He leads me personally to perhaps "up" that, or...however He leads. He multiplies the seed of the sower! Amen. 10 Now may He who supplies seed to the sower, and bread for food, supply and multiply the seed you have sown and increase the fruits of your righteousness, 11 while you are enriched in everything for all liberality, which causes thanksgiving through us to God. It's God that supplies the seed to the sower! It's God that will supply and multiply the seed sown! It's God that will increase the fruits of our righteousness! It's God that we give thanks to. It's all from Him and to Him be all glory. Amen. I see that as Him saying that He will even make us more and more generous in our giving, as God will increase the fruits of righteousness (generosity) as we are lead by Him, by His Spirit, to do so. It would be great to move through the different currencies. $1's, $5's, $10's, $20's, $50's, and then even giving $100 bills to 7 OICers...monthly!!!! YOWSA!!!! LOL wouldn't that be just like God to be so wonderful to use us in such a way. Oh how wonderful to be so blessed that we are able to freely bless others like that!!! Wouldn't that be glorious!!! Woohoo! I say Yes Lord, Yes! Use me to bless others like that Lord! Let all your blessings, including finances, flow through me to others, Father! AMEN. God is my provider. I want to be lead by Him alone in all that I do with my finances, as well as with everything else in my life. Amen. ONLY GIVE IF YOU BELIEVE GOD HAS BLESSED YOU WITH SOME $ SEED TO SOW! HE'S THE ONE THAT GIVES SEED TO THE SOWER! It's best if we PICK A DATE OF THE MONTH THAT YOU WANT TO GIVE ON. It's easier to remember each month if you give on the SAME DATE monthly. Most of us will GIVE on our chosen date each month. 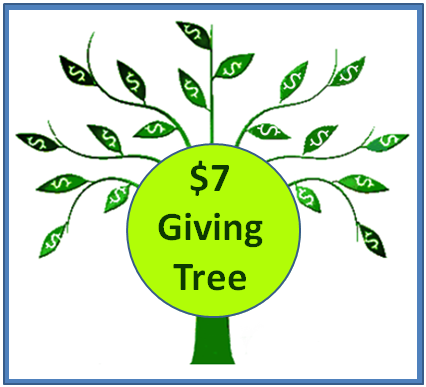 If you decide to give $1 a month to JUST 1 of the 7 OICers, then do that! If you decide to give $1 a month to your whole list of 7 OICers, then do that! That's what my vision is! Everyone hitting THE GOAL of doing a "7" thing! -- Some will start with the vision of giving $7 a month. -- $1 to each of the 7 OICers on the list you receive from your coach. THAT WOULD BE A WONDERFUL TEAM GOAL! -- Members will only roll OFF the TOP of FULL LISTS when they have moved up into the TOP #7 spot, and an 8TH person comes along and wants to add their email address to the Bottom of the list and all 7 SPOTS ARE TAKEN. The TOP #7 person will roll off, as the new person adds their e-address to the bottom and moves everyone up one spot. There are only 7 available spots on any list. Just SEND a NEW, SEPARATE EMAIL, to your OIC Coach letting them know that you want to participate in the 7DGT and ask for the 7DGT email-list. YES! I want to participate in the OIC's 7DGT. Please send me your 7DGT list! Your coach will send you a list of the e-addresses of your OIC coaches that are participating. Each person that wants to participate, gets the list from their OIC Coach. Then if you want to be added to the list, you can add your e-address to the bottom of that same list. (IF the list does not have 7 e-addresses on it yet, DO NOT Remove ANY e-addresses. You would just add your e-address in the open available spot right under your coach.) Then you can give this updated list, with your e-address directly under your coach's e-address, to your OIC members that ask to participate. 1. You GIVE to the list your coach sends to you. Keep that list for your giving. 2. Then You MAKE a second list, that has your e-address added to the bottom, that you can send to the OICers that you are training, when they send you an email saying they want to participate! WHENEVER ANYONE SENDS A 7DGT LIST TO ANYONE, YOU MUST CC THE EMAIL YOU ARE SENDING TO EVERYONE ON THE LIST. WHEN YOU RECEIVE THE 7DGT LIST FROM YOUR COACH, MAKE SURE YOU SEE THAT IT WAS ALSO SENT (CC'd) TO THE WHOLE LIST WHEN IT WAS SENT TO YOU. But first, let me explain something. "this is an open available spot" that's because you do not have a list of 7 OIC Coaches yet. It still needs more OIC "GIVERS" to build and to ask for the list and add their e-addresses to it. After it accumulates 7 e-addresses it is a full list. This OIC GIVING LIST is for OIC Members ONLY. If anyone else wants to be added to your 7DGT list, just send them your OIC Webpage link so they can join the OIC with you. Then in STEP 2 of our training, if they want to participate in the FREE WILL GIVING PART, they can let you know, just like everyone else does. And if they want to they can build their group with you. Just like everyone else does. IF SOMEONE ONLY WANTS TO PARTICIPATE IN THE 7DGT THAT'S FINE, BUT THEY STILL NEED TO JOIN THE OIC AND MAKE THEIR WEBPAGE SO THEY CAN SHARE THE 7DGT WITH OTHERS IF THEY CHOOSE TO. -- This is a GIVING Tree. -- This is NOT a STEALING Tree. -- We do not allow anyone to add more than your own 1 email address. Just 1 email address per OIC Member/Coach. To add more than 1 would be stealing from someone else. That is NOT allowed. Please DO NOT add more than 1. IF YOU DO NOT HAVE 7 OIC COACHES IN THE 7DGT BEFORE YOU. IF you were sent the list above, you would simply add your e-address in spot #4 and leave everything else just as it is. You do not change anything else. You do not remove any email addresses. You simply add your info into the "open available spot" directly under you coach's email address. That's all you do. Then give the newer list, that has your pp e-address on it, to OIC Members when they tell you that they want to participate in the 7DGT. BELOW is an EXAMPLE of a list when it DOES have all 7 spots filled. This is when we need to start REMOVING from the TOP e-address so we can ADD a new e-address to the BOTTOM. Add YOUR email address at #1 BOTTOM spot. BELOW is an EXAMPLE of what the list above would look like after it is updated and YOUR e-address is added to the bottom #1 spot. and God wants us to be a blessing. Just in my circle of OICers, I know that many,...most, if not all of them, would be greatly blessed by even the smallest about of any financial help. If I decide to just send some $ to any of them, I can. It's up to me. Right? Do you agree that this is just plain GIVING? This is NOT a business. There is NO Product and NO Service. It's just free will giving. Without asking for or expecting anything in return. DO NOT EXPECT TO GET ANYTHING IN RETURN IF YOU PARTICIPATE. IF YOU EXPECT ANYTHING IN RETURN, YOU ARE NOT GIVING! Spend time with the Lord. Only give if He gives you a heart to freely GIVE. OIC members DO NOT "have to" join nor participate in the 7DGT. But every Christian should be giving somewhere, somehow to somebody. ONCE YOU HAVE CASH FUNDS IN YOUR PAYPAL ACCOUNT, YOU CAN SEND CASH TO A FRIEND'S PAYPAL, USING THE CASH IN YOUR ACCOUNT AND THERE WON'T BE ANY CHARGE FOR PROCESSING. -- IF you have cash in another PayPal account, you could send some cash over to your new PayPal account. Just click on "send to a friend" and send some it to your new account. * CLICK the link to "Change" and then select "Sending to a friend"
scroll down and click the "Send" button. God bless you dear brothers and sisters in Christ. Glory to God forever. Praise the Lord Jesus Christ! Amen. Hey...thank you for reading all of this. YOU are awesome. To Applicable Copyright Laws. Copying Of Any Sort Is Strictly Prohibited And Illegal. Copyright 2018 All Rights Reserved Internationally.